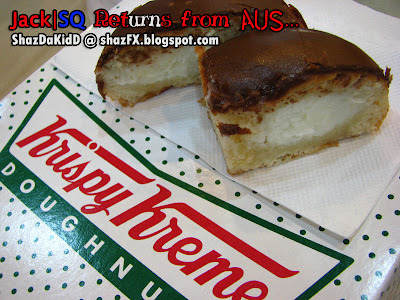 chronicles of a frenchie: Jack|SQ Returns to KL... & Scott's B'day!!! 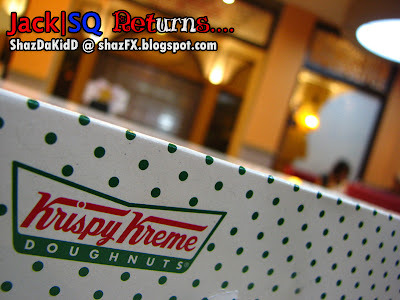 Jack|SQ Returns to KL... & Scott's B'day!!! 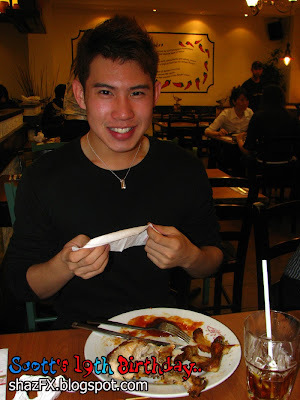 Remember Jack Lim? 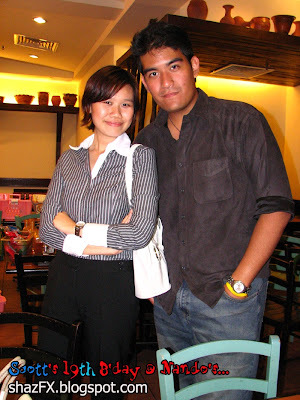 Well some of you may have known him through his blog but i certainly knew him well before this blogging world! Anyways, Jack one of my closest friends - more like a brother to me just returned back from Sydney Australia for his summer holidays here. Previously he was from HELP UC, and i took him in to be an intern here at Xfresh (ASTRO) for a while and experience how its like in the entertainment / media industry... (ahh.. this the part where you go... "ahhh no wonder i saw him before in shaz's blog posts at certain media events.." LOL...) neways... the story goes...like this! 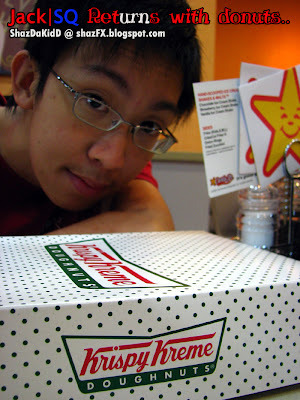 He recently came back right after his exams... and we went for tea and he brought a box of Krispy Kreme donuts for me to have!!! OMG... this was like the moment... that i've been waiting for! Well 2 moments actually, one which is to eat Krispy Kreme donuts (the one that i've heard so much about from everyone) - thanks to Jack i get to savour this awesome thing they call DONUT! The other is to sit down with this chap after long time never seen him as he went to Aussie to further his studies. 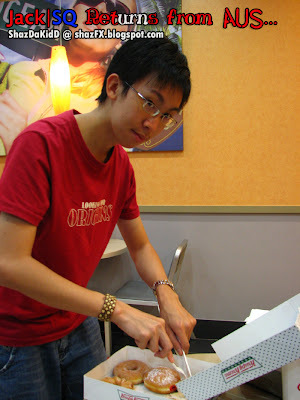 Thx bro, thx to you I get to taste Krispy Kreme!!! I wonder why they spell it as "doughnuts"... hmm!!! You mean the size of the donuts? Well its slightly bigger than J.Co or Big Apple's donuts... but sugar content is confirmed twice HIGHER! Mwhahah... SUGAR RUSH yO!!! Guess how much each of those donuts costs... well they are around AU$ 2 sumthin each... if i am not mistaken close to AU$3. Hmmm... that's like wayyyy so expensive! 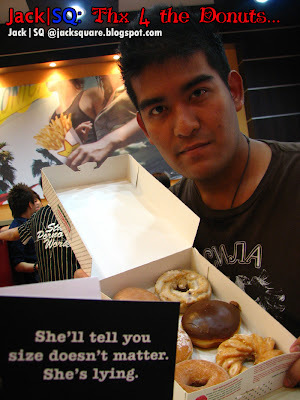 So what to do... we Malaysians go for J.Co or Big Apple! 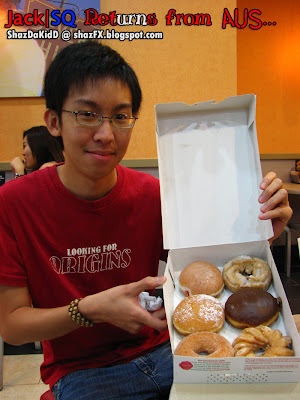 Some of the varieties of the donuts that they have at Krispy Kreme... i love chocolates!!! The fillings inside each donut is different and is super sweet! The sugar / dietary content of each donut is stated at the bottom of each KK boxes! 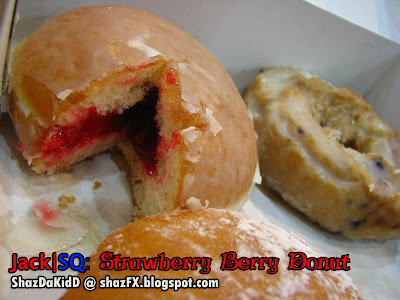 This is the strawberry berry donut! HEhehe.. named that myself! Its so so so SWEET! Jack said... don't eat so much! Later diabetic! I agree... too much of sugar but the hype is so so so WELL! I mean about KK Donuts! Thank you thank you thank you!!! 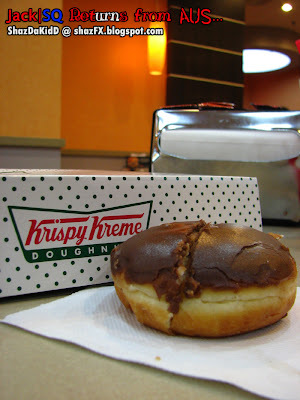 Krispy Kreme was awesome...! You can never know how much happiness and joy can donuts such as this bring joy to one another! Now - back to normal programming! It was Scott's Birthday last saturday and last monday - I organised a dinner with some friends to gather up and catchup... not forgetting to celebrate Scott's bday aswell! 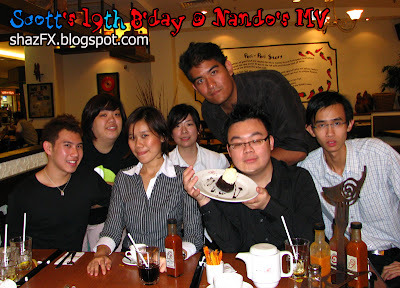 So here he was with all of us for dinner at Nando's MidValley! Scott finally turned 19 and he was in style... yes! 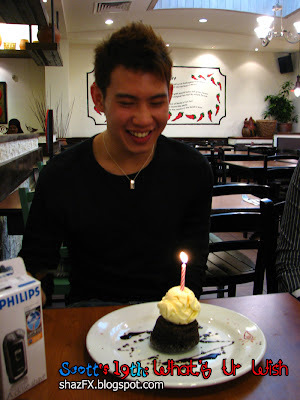 On his birthday we celebrated at The Apartment @ the Curve, wahhh i tell you the guy has style! Fashionable... anyways Happy Birthday to you bro! Here's the photos!!! More photos from Scott's B'day celebration at the Apartment will be up real soon! HOT staff only allowed! Mwahhaah... yes Scott used to work at Nando's! Way back long time ago! Ok la... the dude needs to have a close shave!!! 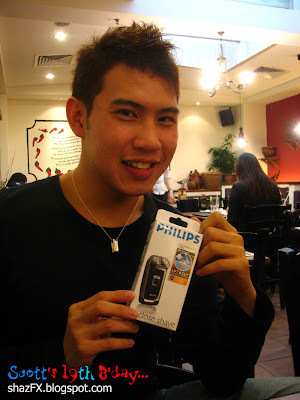 so here's a brand new shaver! The latest design / model for a guy that's on the move! Together with us this night was Sandra! Yes she knows Scott way at Bon Odori!!! 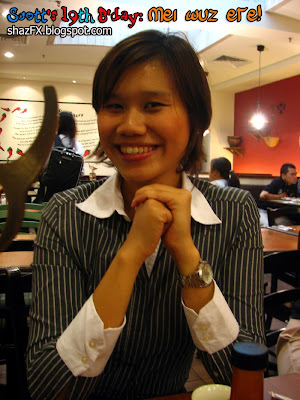 Not forgetting Mei, my former colleague / intern @ Xfresh! She's been one very helpful and nice friend! 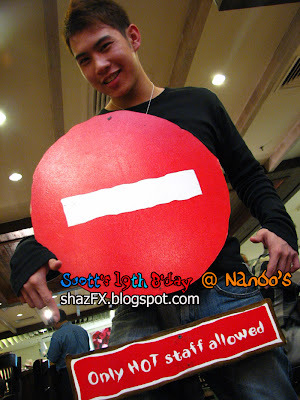 Oh ya... and the b'day boy was so manly that he tried HOT flavaaa @ Nando's! Good thing that they had free refills! 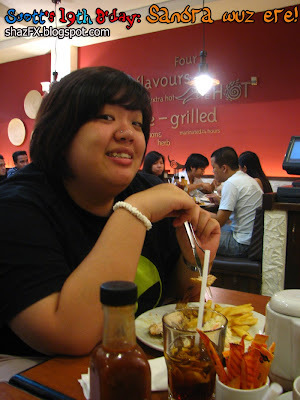 Mei and Me at Nando's! She was well dressed..mwahhaha! Just came back from work is it! Here's a group photo of all of us here on this day! Dinner was great, food was good...company was awesome! Happy Birthday Scott!!! Oh yea... by the way, how not to celebrate a b'day without a cake! 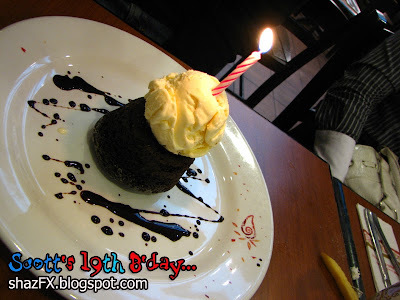 Here's a chocolate mud pie from Nando's!!! omg! is it donuts season? 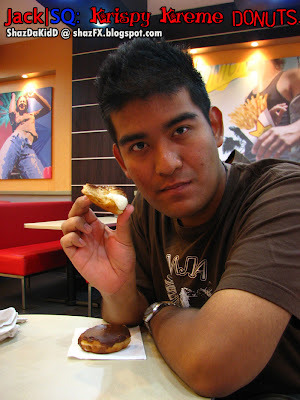 penang just open missy donut, everyone is like talking about donut now.